What is cognitive rehabilitation for people with brain injury, including TBI and stroke? What is the treatment process? What are the goals of treatment? Michelle Ranae Wild, M.A., describes the principles of this type of rehabilitation and its potential to aid in recovery in this 60-minute webinar. This webinar aired live February 11, 2016, and is the first in a series of seven webinars. To view the all the webinars in the Cognitive Rehabilitation series, click here. Michelle Ranae Wild is a professor in Coastline Community College's nationally-recognized Acquired Brain Injury Program. She has taught cognitive remediation strategies to individuals with various levels of cognitive deficits for over 29 years. Her expertise in cognitive remediation and instructional design has led to a training approach she calls "Making Cognitive Connections." She has presented the "Making Cognitive Connections" approach at numerous conferences across the country. 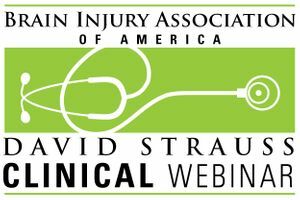 This webinar provides one Academy of Certified Brain Injury Specialists (ACBIS) CEU.